Muramasa: The Demon Blade was truly a lovely game. While it was originally released in 2009, there are now allegations that it's been copied by a Korean game developer. 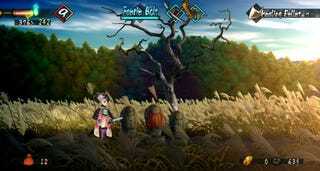 There are claims that the knock-off even stole Muramasa's original code. As noted on My Game News Flash (via tipster Sang), upcoming Android title Soul Hearts from NeoWiz Games seems to use an art style that looks incredibly close to Muramasa's. Let's compare. Note that Soul Hearts is on the top of each set and Muramasa is on the bottom. And according to Korean Twitter user Chungbi, it looks like Soul Hearts features some of the same items that are in Muramasa. Here is a comparison. The implication is that Soul Hearts might have even lifted data from Muramasa. The allegations were serious enough that NeoWiz has commented on the situation, telling Korean game site Gamemeca (via Sang), "It is true that some parts of Murasama were used as an inspiration for the backstory and the lore, but the gameplay is totally different." A company spokesperson told ThisIsGame (via Sang), "Soul Hearts was trying to portray an old Asian world. It seems like it was inspired a lot by Murasama in the process. Regardless of whether it was actually plagiarized or not, I'm sorry about this. The game has just finished Closed Beta Testing so we will thoroughly go over any parts that may cause issues and change them before the release." Sounds like they're not saying Soul Hearts is a knockoff, but that they're more than happy to change the parts that are causing controversy. M'kay!